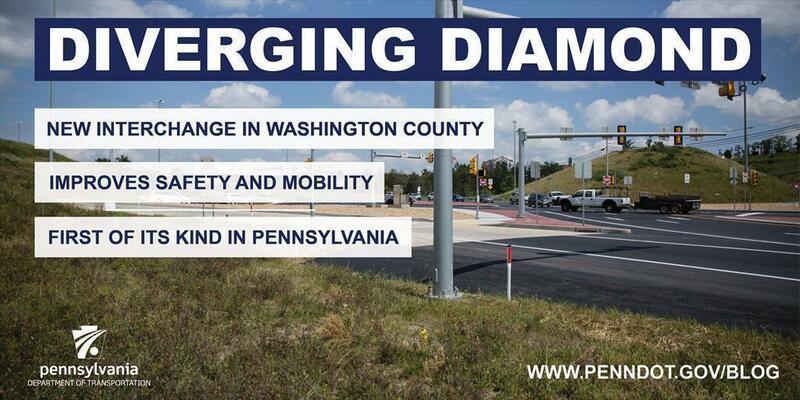 PennDOT and the Wolf Administration recently celebrated the opening of the state's first diverging diamond interchange (DDI), a new kind of interchange that promotes increased safety and mobility. As part of its efforts to improve I-70 in Washington and Westmoreland counties, PennDOT chose the DDI design because it could use much of the same footprint as the previous, substandard cloverleaf interchange, it minimized impacts to area businesses, and it would increase mobility and safety on I-70 and Route 19. The video above shows a simulation of how the I-70 DDI works. Why Choose a Diverging Diamond Interchange? DDIs are ideal for interchanges with significant left-turning traffic as left-turning traffic at traditional diamond interchanges can significantly delay through traffic on the cross road. They also improve safety by reducing vehicle-to-vehicle conflict points from 26 — as in a conventional diamond interchange — to 14 points. The first DDI opened in Springfield, Missouri, in 2009. A year after its construction, officials evaluated the number of crashes compared to the five-year average of the previous interchange. They found that left-turn crashes were totally eliminated, right-angle crashes were reduced by 72 percent, and rear-end crashes were reduced by 29 percent. Though the design seems complex, users find it easily navigable. And another study comparing DDIs to traditional diamond interchanges saw travel delays reduced by 15-60 percent and throughput increased by 10-30 percent. Governor Tom Wolf lauded the interchange design for its benefits to all Pennsylvanians. "Our transportation mission is to keep people and goods moving safety and efficiently, and this project brings some of the latest industry improvements home for Pennsylvanians," Governor Wolf said. "This interchange improves travel for the public and businesses, a goal that I'm committed to across the state." PennDOT's State Transportation Innovation Council also has recommended the use of DDIs for more statewide projects. Currently, there are three more projects that include a diverging diamond interchange under design in the state. The I-70 interchange upgrade is an example of how more work is needed on roads across the state, especially Interstates and low-traffic roads. In February, Governor Wolf and PennDOT announced PennDOT's Road Maintenance and Preservation initiative, or Road MaP, which will invest $2.1 billion in maintenance and highway and bridge capital projects over the next 10 years. Of the projects, $500 million will be allocated to an Interstate preservation and reconstruction program, bringing that total program, begun in 2016, to $1 billion over the next 10 years.